UEFA Super Cup Final 2014 – Recruitment Re-opened! 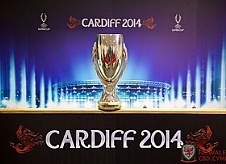 As the Welsh Capital prepares to host the 2014 UEFA Super Cup Final, find out how you can be a part of it. It”s not too late – following an initial recruitment drive earlier in the year a fresh recruitment window has now opened …to find out more read on! – Taking place at the Cardiff City Stadium and kicking off at 7.45pm on 12th August 2014, the UEFA Super Cup will see the UEFA Champions League winners take on the winners of the UEFA Europa League in the ultimate battle for European football bragging rights! As Cardiff celebrates being European Capital of Sport 2014, this event provides the ideal opportunity for Wales to showcase the Capital City”s credentials as a fantastic host city for major sporting events adding significant weight to Wales” bid as a host nation for Euro 2020. A significant volunteer effort is needed across the city to extend a warm Welsh welcome to supports and officials, enhancing their visitor experience and leaving them with a great impression of both Cardiff and Wales. * Please note: If you are not already registered with the Sport Cardiff VSB you will need to register.